In recent years Triplar has seen a marked increase in the number of ‘pop-up’ stores being specified by clients who are keen to increase awareness of their brand, take advantage of seasonal shopping trends or promote a new product range. But when Dr Martens brand manager Fresh approached Triplar in conjunction with design agency Campaign, no one knew what a phenomenon the shoemaker’s first pop-up store would become. 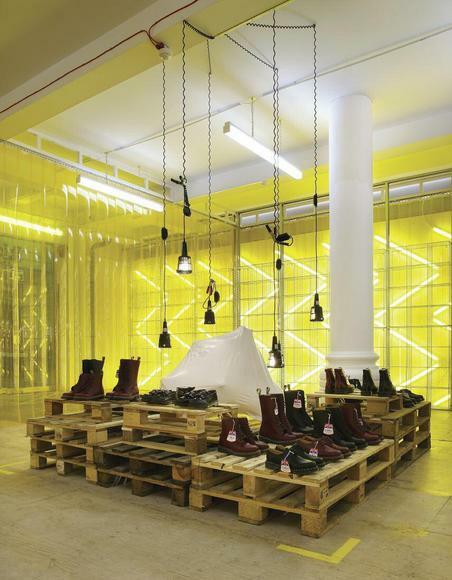 A 180 sq m unit in Spitalfields Market, London, had been identified and Dr Martens’ brief was to create a store to a small budget that could be replicated globally. The concept behind the design was inspired by Dr Martens’ heritage. 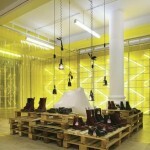 The boot was originally worn by working class society, the postmen and factory workers of the UK and the concept echoed the industrial spaces that those workers occupied. Working to a tight budget of £15,000, designer Campaign created a rugged, paired down scheme that made use of industrial materials. The design combined traditional electrical fittings like light bulbs suspended without shades, alongside custom elements, including a bespoke cash desk. 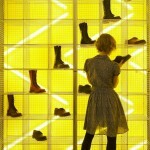 The brand’s trademark yellow dominates the design, with footwear intended to be displayed on a wall illuminated by a zigzag of fluorescent tube lights overlaid with yellow PVC fly screening. 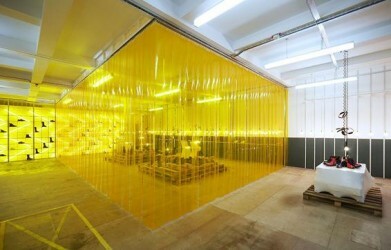 A large heavy-duty, bright yellow fly screening was also integrated into the design and segregated the sales floor. The ambitious design had to be realised in just five days and Triplar knew that making every day industrial fittings gel together and work effectively in a retail environment would be a unique challenge. Entrusted with bringing the design to life, Triplar had to work closely with Campaign to reverse engineer elements of the design and find cost savings. The initial stages of the project involved adding and plastering stud walls that would help frame the shop floor and separate the back of shop storage area. All walls were also ‘distressed’ to make them appear older. Triplar specified and adapted standard metal stud to form the merchandise display system. Suspended site construction lamps were then used to provide feature lighting. Many of the fittings had to be constructed on site, with the Triplar team shrink-wrapping salvaged furniture and pallets – the latter being used as display units throughout the store. Materials used included a metal stud wall system used to create the display system and warehouse fly curtain, which was fixed into place and used to create divisions on the shop floor. The team also came up with the idea of creating a cash desk from salvaged crates and palettes. Elements of the store were designed with flexibility in mind. 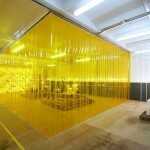 Triplar had to ensure the yellow PVC fly curtain could be moved in future to change the way the store is divided. This meant fitting the curtain to a ceiling grid that could be adjusted. Signage was to be both applied and stencilled with spray paint onto the store’s glass facade, as well as its floor. Triplar Managing Director Tim Rodwell said: “The tight timescale and unique nature of this exciting project made it particularly challenging. But the finished result and subsequent praise the store has attracted speak for themselves. “The key element of the challenge was to down spec the existing pre-finished shop unit to give it a unique warehouse feel atmosphere. At the earliest stages this involved making the existing walls look older and more worn than they were. 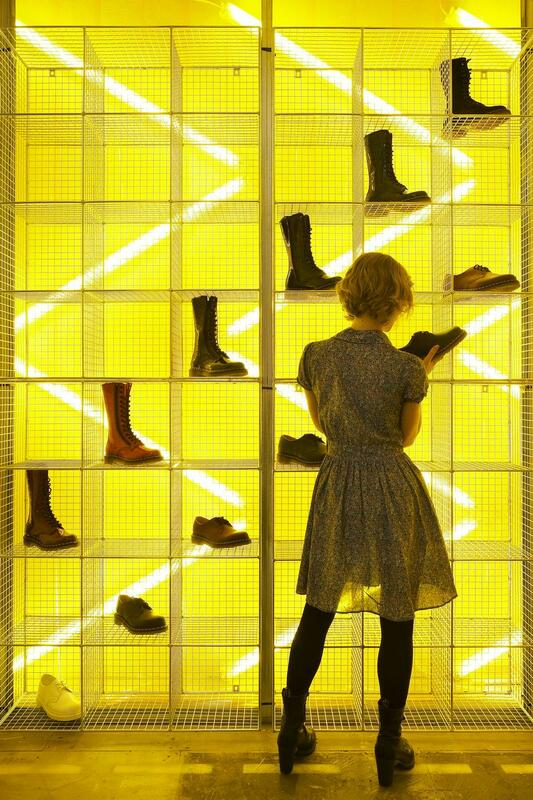 The Spitalfields store quickly outgrew beyond its temporary beginnings and is now a permanent outlet for Dr Martens. It has also attracted a considerable amount of critical acclaim and won the Retail Week Interiors Awards Pop-up Store of the Year 2010. The relationship between Triplar and Dr Martens has also flourished, with the shopfitter recently competing the shoe brand’s store in Leeds – its first outside of the capital.